Dane Charles Iorg is a retired Major League Baseball infielder and outfielder. 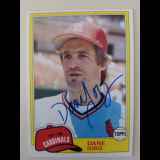 He played for ten seasons for four teams, including eight seasons for the St. Louis Cardinals. Iorg earned the game-winning hit in game six of the 1985 World Series. His brother Garth also played in the major leagues. New Response (Success): Mr. Iorg kindly signed all three of my Baseball Ca..